London on business, working and sleeping in the City, far from the more rough and tumble streets I used to wander with my cousins. I love this building on Wood Street, not far from the office. 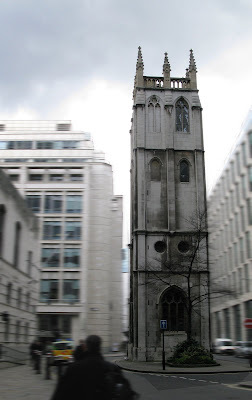 It's an old church tower, currently a private residence, according to Wikipedia, but the oddness of it, a tower sitting on an island in the middle of a city street, is what I love. I'd like to have a barbecue on the roof.